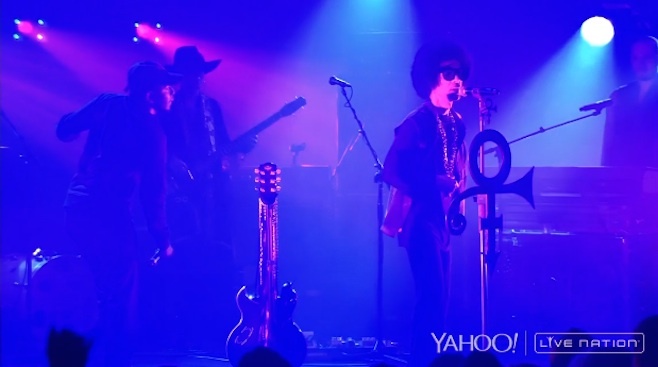 Last night, Prince live streamed a record-release performance on Yahoo to coincide with the release of his two new albums, Art Official Age and PLECTRUMELECTRUM. And as part of the celebration, Prince — who has been known to bring out some heavy-hitter guest performers (including A Tribe Called Quest’s Q-Tip and, um, Kim Kardashian?) — brought Kendrick Lamar out onto the stage. The two artists performed “What’s My Name,” a deep cut from the 1998 triple-disc Crystal Ball set. You can watch the Prince Kendrick Lamar magic below, but unfortunately the only available video is merely a preview snippet. Prince is pretty controlling about his own image, so don’t necessarily expect to get too much content for free. In any case, the 30 seconds you get is pretty fun. Also, the show is being replayed for 24 hours, so watch it here and catch up with the funk you might have missed. Read our recent Celebrate the Catalog feature, in which we review every Prince album.